Genetic variation in the protein tyrosine phosphatase non-receptor type gene 22 (PTPN22, encoding lymphoid tyrosine phosphatase, LYP) influences the risk of developing multiple autoimmune diseases, but the underlying mechanisms are not completely understood. In a recent study published in Genome Medicine, Ronninger et al. showed that there are differences in the expression of PTPN22 isoforms between peripheral blood mononuclear cells from rheumatoid arthritis patients and those of healthy controls. This study provides new insights into the role of PTPN22 in autoimmune diseases. The protein tyrosine phosphatase non-receptor type 22 (PTPN22), also called lymphoid tyrosine phosphatase (LYP), is expressed exclusively in hematopoietic cells and is a critical gatekeeper of T and B cell receptor (TCR and BCR) signaling. In the TCR signaling pathway, LYP acts downstream of receptor binding to inhibit the activity of key signaling effectors, thereby attenuating T cell activation. Specifically, LYP has been implicated in the dephosphorylation of the positive regulatory tyrosine residue in target Src-family protein tyrosine kinases, including FynT (Y417) and Lck (Y394). Recent studies have shown that LYP is also involved in the modulation of B cell populations and in their tolerance checkpoints through BCR signaling, but its precise mechanisms have not yet been established [1, 2]. PTPN22 has been identified as a shared susceptibility gene for a variety of human autoimmune diseases, including type 1 diabetes, rheumatoid arthritis (RA), autoimmune thyroid disease, systemic lupus erythematosus (SLE) and inflammatory bowel disease . Genetic variation in PTPN22 has been investigated in autoimmune diseases, but until recently the role of PTPN22 modulation at the mRNA or protein level had not been considered. Alternative splicing can result in the expression of different LYP isoforms and, in a recent study published in Genome Medicine, Ronninger et al. reported the first evidence of altered expression of PTPN22 splice forms in RA. Two missense single nucleotide polymorphisms (SNPs) in PTPN22 have been linked with autoimmunity: the R620W (C1858T, rs2476601) variant in exon 14, which seems to produce a gain of function, resulting in stronger negative regulation of T and B cell activation; and the R263Q (G788A; rs33996649) change in exon 10, which alters an amino acid in the catalytic domain of the enzyme, resulting in reduced phosphatase activity . These variants have been consistently associated with susceptibility to RA, mainly in European populations: it is now clear that the W620 allele is one of the most consistently associated genetic factors underlying RA risk, whereas the Q263 allele acts as a protective factor against RA, independent from the R620W variant effect (Figure 1) [5, 6]. Other studies have suggested that additional variants in the PTPN22 gene region could influence RA susceptibility . Nevertheless, the strong linkage disequilibrium (LD) across this region makes it difficult to determine whether these associated SNPs are independent risk factors for RA or are in LD with the known R620W and R263Q variants [8, 9]. The possible effects of different forms of LYP on rheumatoid arthritis (RA). Left, illustration of LYP isoforms: LYP_v1 has four P motifs, but LYP_v2 lacks the P2, P3, and P4 motifs. Healthy patients (top) have a balance of LYP protein isoforms (indicated by the scales and number of proteins shown, left); they tend to have a lower frequency of the W620 allele (R620W variant) of PTPN22 and a higher frequency of the Q263 allele (R263Q variant) (right), which leads to a low risk of RA. Ronninger et al. have shown that the ratio of the long (LYP_v1) and short (LYP_v2) isoforms of PTPN22 is significantly higher in RA patients (bottom) than in controls, and RA patients have a higher frequency of the W620 allele and a lower frequency of the Q263 allele. These differences might lead to greater inflammation in RA patients. Since the discovery of the importance of PTPN22 in lymphocyte function and its association with many autoimmune diseases, there have been several attempts to understand the biological mechanism by which PTPN22 gene variants might influence protein activity and subsequent changes in cell function. Recent studies have shown that the W620 allele (of the R620W variant) enhances positive selection of autoreactive B cells, influences thymic and splenic enlargement, which is accompanied by increases in T cell number, and increases activation of dendritic cells [1–3]. Moreover, levels of the mouse LYP protein homolog (Pep) were observed to be dramatically reduced when the equivalent variant to R620W (Pep619W) was expressed. It was suggested that this could be due to more rapid degradation of the Pep619W variant by the calpain 1 cleavage protein than of the wild type . Alternative splicing is a process whereby distinct mRNA transcripts are generated from a single gene so that the resulting splice variants can be translated into different protein isoforms. During this process, a particular exon can be connected to any of the other exons to form a mature mRNA. Hence, the alternative isoforms share part of the sequence but not all of it. The PTPN22 gene has 11 known spliced mRNAs that putatively encode functional proteins, according to the annotation of the human genome and transcriptome in AceView . Surprisingly, only two splice forms, encoding LYP_v1 and LYP_v2, have been well characterized (Figure 1). The first encodes an amino-terminal PTP domain, a central region of unknown function, and a carboxy-terminal portion containing four proline-rich motifs termed P1 to P4. The alternatively spliced LYP_v2 has a shorter carboxyl terminus, resulting in the absence of the P2, P3, and P4 motifs . Ronninger et al. have investigated the expression of these PTPN22 splice forms in three independent study cohorts consisting of Caucasian patients with RA and healthy controls. They assessed the mRNA expression of the LYP_v1 and LYP_v2 splice forms in peripheral blood mononuclear cells (PBMCs) collected from the patients and controls. They also sought to determine any correlation between PTPN22 mRNA expression levels and 25 SNPs of the PTPN22 gene region, including the R620W variant. They found that the expression of LYP_v1 and LYP_v2 splice forms in unstimulated PBMCs from RA patients was different from that of controls. Cells from RA patients showed lower levels of LYP_v2 and higher levels of LYP_v1 than cells from controls, and the difference was more pronounced when the ratio of expression of the two isoforms (LYP_v1/LYP_v2) was compared between RA patients and controls. Conversely, analysis of splice form expression levels in an additional cohort consisting of multiple sclerosis (MS) patients revealed higher levels of LYP_v2 in MS patients than in controls. To gain insight into the mechanism of differential expression of the splice forms, the authors  measured the expression of LYP_v1 and LYP_v2 in interferon-γ-stimulated PBMCs from the same RA patients and healthy individuals. The expression of splice forms was comparable in the stimulated cells, indicating that proinflammatory conditions may directly change the transcriptional profile of PTPN22 splice forms. However, the study  provided no clear evidence of association between the SNPs tested and the expression levels of PTPN22 isoforms. The authors speculated that this could be due to a lack of statistical power owing to the low frequency of PTPN22 risk variants in the population. The major contribution of the Ronninger et al. study  is the finding of a correlation between the ratio of the splice forms and disease phenotype. 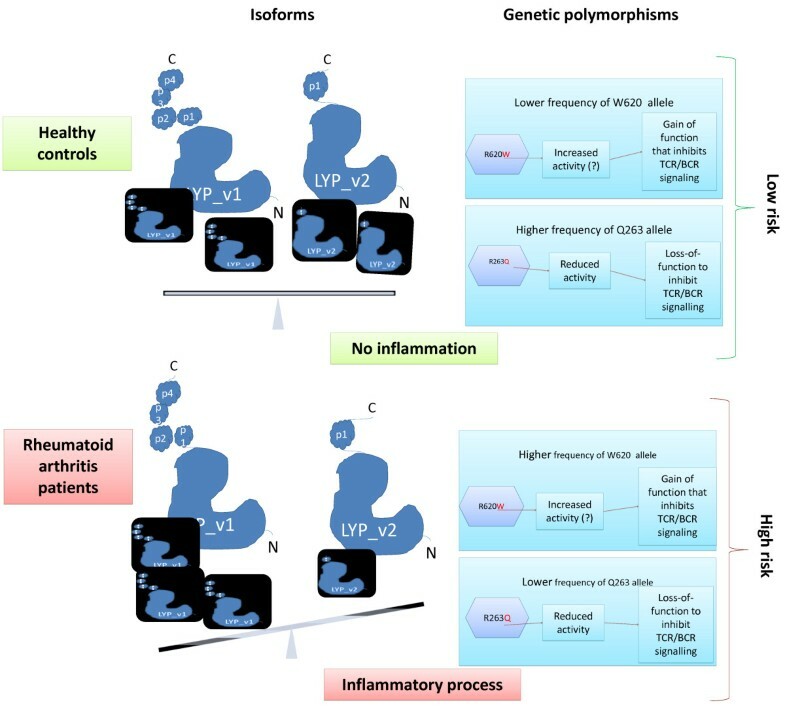 These observations suggest that the pronounced structural differences between these isoforms might affect events involved directly in inflammatory processes. Three examples of this are as follows. Firstly, T cell behavior is modulated by the interaction of LYP with CD2-binding protein-1 (CD2 is a cell adhesion molecule that influences the efficiency with which T cell receptors find a major histocompatibility complex (MHC) molecule with an antigenic peptide). LYP_v2 lacks several consensus sequences described for LYP_v1 that could affect the interaction with CD2-binding protein-1. Secondly, the phosphorylation of LYP_v1 may depend on the cell cycle: a consensus sequence of the carboxyl terminus of this variant is recognized by the cyclin-dependent kinase 1 (CDK1), a cell cycle regulatory kinase. This consensus sequence is not present in the LYP_v2 isoform, which could have an effect on the cell cycle in the lymphoid cells that are expressing this isoform. Finally, the LYP_v1 and LYP_v2 isoforms could interact with different sets of Src homology 3 (SH3) domains, because LYP_v1 contains four potential SH3 domain binding sites, whereas LYP_v2 contains only one. However, further studies are needed to understand the influence of the differential expression of the PTPN22 isoforms, not only in RA, but in other autoimmune diseases. There is increasing evidence that the same PTPN22 genetic variants influence several autoimmune diseases, but the risk conferred by these variants is not the same in each autoimmune disease. The W620 allele increases the risk of developing RA and SLE in European populations. At the same time, this allele confers protection against Crohn's disease and has no effect in MS. The role of the R620W variant seems greater in RA and SLE than in systemic sclerosis (SSc). On the other hand, the R263Q variant has an important protective role in RA, SLE and ulcerative colitis, yet has no effect on genetic predisposition to SSc. The results presented by Ronninger et al. have now revealed different expression levels of two PTPN22 splice forms in RA and MS: the short isoform LYP_v2 was found at lower levels in RA patients than in controls, whereas LYP_v2 was found at higher levels in MS patients than in controls. This is in line with the fact that MS is not associated with polymorphisms in PTPN22 and supports disease specificity. Moreover, the ratio of the long and short isoforms of PTPN22 was found to be significantly higher in RA patients than in controls. Collectively, these results suggest that there may be complex genetic and immunological mechanisms in common underlying these autoimmune diseases. It is possible that an increased LYP_v1/LYP_v2 isoform ratio in RA patients might indicate an activated inflammatory process (Figure 1). If this is demonstrated with more functional studies, replicated in other cohorts and tested in other autoimmune diseases such as SLE, SSc or type 1 diabetes, it could be used together with other genetic, immunological and physiological markers to improve the diagnosis and treatment of RA, and possibly other autoimmune diseases. It has also been hypothesized that a selective inhibitor of LYP could revert the negative effects of the R620W variant on TCR and BCR signaling, and thus might constitute an effective targeted therapy for autoimmunity in carriers of the autoimmune-predisposing variant . Although much remains to be understood about the genetic variation and regulation of PTPN22, the Ronninger et al. study  has provided new mechanistic insights into the role of PTPN22 splice forms in RA, opening up a new avenue of research for understanding the genomics of autoimmune diseases. The authors were funded by the 'Ayudas Predoctorales de Formación en Investigación en Salud (PFIS-FI09/00544)' from the Instituto de Salud Carlos III and grants SAF2009-11110 from the Spanish Ministry of Science, CTS-4977 from Junta de Andalucía, Spain, in part by Redes Temáticas de Investigación Cooperativa Sanitaria Program, RD08/0075 (RIER) from Instituto de Salud Carlos III (ISCIII), Spain and by Fondo Europeo de Desarrollo Regional (FEDER).